When selecting a spray gun you have a choice between gravity feed (cup on the top) and conventional feed (cup on the bottom). It is really a misnomer to call a conventional feed spray gun “siphon feed” because that term has a specific meaning. However, using the term “siphon feed” often communicates “cup on the bottom” to many technicians. This article discusses the differences between siphon feed and gravity feed spray guns. Conventional feed guns were the first to be widely used in auto body repair. Until the advent of HVLP (high volume low pressure), all conventional feed spray guns were siphon feed. One of the oldest and most reliable brands for siphon feed guns is DeVilbiss (they make great gravity feed guns, too). In the 1980s, gravity feed spray guns came into wide use and their popularity has overtaken the use of conventional feed spray guns. Painters have begun to favor them over conventional feed guns and the introduction of HVLP as a requirement by environmental laws made gravity feed the natural choice. The main difference between the two guns is also something they have in common: the atomization of fluid at the tip where the paint leaves the fluid nozzle. There are two passageways in a spray gun: one for air and one for fluid. 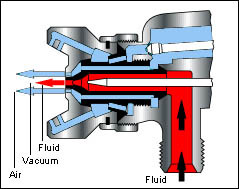 Atomization is achieved by a vacuum formed by the air rushing past the fluid passage while drawing the fluid into the air stream. At this point, air is mixed with fluid and a spray mist ejects from the nozzle. In order to achieve sufficient atomization, paint has to be either drawn up from below the gun (conventional siphon feed) or fed from the top down into the nozzle (gravity feed). In order to achieve sufficient atomization with a siphon feed spray gun, greater air pressure must be used in order to attain a strong enough vacuum to pull the fluid up the feeding tube from below. The requirement for greater air pressure in siphon feed guns is the main limitation for their use in HVLP systems. It is much more difficult to keep low air pressure and achieve adequate vacuum. For those users who prefer conventional feed spray guns, it is possible to achieve atomization at lower air pressures by pressurizing the cup. This assists the siphon process by forcing the fluid up the feed tube. You can identify a pressurized cup by the presence of an air tube that extends from the air supply to the cup. If you want more information on air pressure for paint guns you may want to take a look at our article about spray gun air compressors. There are many advantages that come with using gravity feed over conventional spray guns. It is obvious that gravity feed overcomes the limitations of a siphon feed design, since less air pressure is required to atomize the paint, making this type of spray gun more efficient. Spraying with less air pressure also has the advantages of less overspray, less waste and greater control for the painter. Thanks to the cup being on top of the gun, there’s no need to disassemble it to remove paint. This has to do with the efficiency of the gun. Since these guns are more efficient than their traditional counterparts, they result in better finishes. These guns are ideal for most coatings, including clear coats. These are the main reasons why painters have been switching from conventional feed to gravity feed guns throughout the years. Conventional siphon feed guns do not have as many advantages today as they once did. However, they still have their place in the auto refinish industry. Good for thinner, specialized coatings. If you’re spraying a specialized coating such as a splatter effect, this paint gun may be best for you. It also works well with metallic paint and pigments. Easier to spray: The conventional siphon feed spray gun offers an intuitive, traditional design for easy spraying. If you’re an old-school painter, you may prefer this type of gun over gravity feed. In most cases, a gravity feed spray gun is the better choice thanks to its efficient and versatile design. Although HVLP is a requirement in most areas, whether or not you use an HVLP gun, gravity feed offers the advantage over conventional feed because of the lower air pressure requirement. However, if you’re accustomed to using traditional spray guns, you may prefer to use a conventional siphon feed spray gun instead. In the market for a new spray gun? Shop our best-sellers below and be sure to browse our paint gun accessories and painting supplies to get everything you need for a high-quality paint job. Having issues with your current paint gun? Check out our spray gun troubleshooting guide.